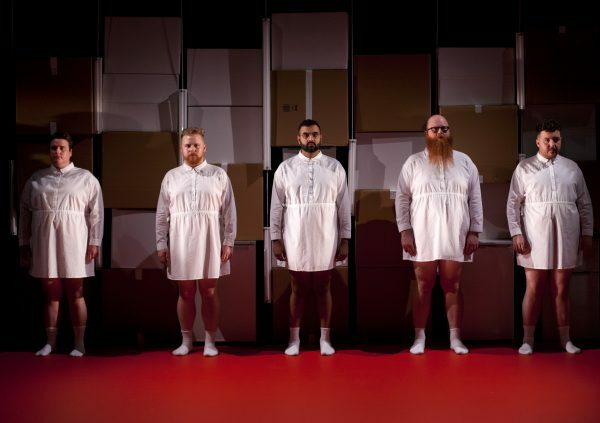 Dealing with themes of race, class, sexuality, and weight, Fat Blokes was a powerful performance that displayed the ‘ugly honesty’ behind the daily experiences of larger men. Directed by Scottee, the show was declared an act of protest, and a demonstration of ‘fat rebellion’. The show was intense, forcing the audience to confront the uncomfortable truth of what it means to be overweight, working class, and queer in today’s society. Through a mixture of interpretive dance (choreographed by Lea Anderson) and hard-hitting monologues, the men took turns to tell their stories. The intersections of identity were on constant display throughout the performance, always drawing attention to the isolation and fear that can come from being seen as different. None of these men were professional dancers or had had any dance training prior to being in the performance. This made it all the more authentic, and firmly established the performance as a protest piece. The men didn’t care how they were perceived, the important thing is that it was done on their terms. Fat Blokes aimed to take back the narrative surrounding large men, and it succeeded. The fourth wall was almost non-existent within the performance; all five men constantly directed their words and actions at the audience. They challenged us, directed their anger at us, pleaded with us, laughed with us. The level of engagement was uncomfortable at times – which was exactly the point. As Scottee said at the beginning of the performance, they weren’t there to make us feel welcome, but to exist as themselves, and if we didn’t like it, we could leave. Needless to say, no one did. Shifting between angry and tender, depressing and uplifting, Fat Blokes was phenomenal in its portrayal of the trials and tribulations of self-acceptance. One particularly emotional aspect of the performance occurred towards the end; the five men were offered a hypothetical pill that would make them thinner in order to fit into societal norms. Their response, explained Scottee as pills were handed out, changed depending on how they felt that particular day. That night, two of the men took the pills. The predominant message that was reinforced throughout was that there is not one way to exist in a large body. Scottee and the other performers demonstrated that living life as a fat man is just as complicated and full of contradictions as everything else.